Elk calls have their time and season. Although elk use herd talk all year long, the rutting season from mid August through early October is the prime time for effectively calling in elk. Like using other game calls, learning to be an effective caller takes time and dedication. Overcalling is quite prevalent and educates the elk. Calling the right amount and in the right situation, however, is deadly. Before we go into that, an explanation of the elk calls is in order. 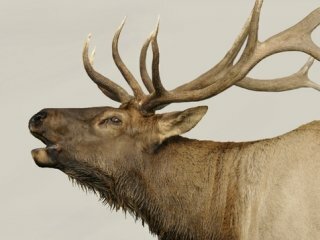 Elk calls come in many different styles, and almost all of the production calls on the market now serve a useful purpose although many produce the same sounds so you do not need them all. Elk calls produce sound by passing air over a reed or rubber to produce sound. Reed calls are usually used to produce cow and calf noises. Open reed calls are great for making drawn out cow calls and estrus cow noise. Bite calls incorporate a reed between two rigid plates to produce a more predictable and less flexible cow call. Squeeze calls such as the Primos Hoochie Mama are extremely simple to use cow calls, but they are limited to a few sounds. Squeeze calls are great for beginning callers and are also great for making multiple calls at the same time along with a mouth call. Production bugles with rubber mouth pieces can produce excellent bull bugles. Most models are much easier to learn to use than a mouth diaphragm. Primos, Carlson, Abe and Sons and several other manufacturers make good bull bugles. These bugles vary somewhat in their use and produce some sounds better than others. Bugles with built in mouthpieces can have a “plastic” sound although the sound isn’t necessarily noticeable to elk. I can tell the difference between a real elk and around 80% of production calls. Some of the difference I would attribute to the caller, some to the call. The most flexible style of elk call is the mouth diaphragm. Diaphragms are a little awkward to learn as they fit inside your mouth. Passing air over the rubber surface makes the call. Mouth diaphragms can reproduce the whole range of elk noise. Mouth Diaphragms used with a bugle tube have a great range for producing all types and variations of bull noise. Used without a tube, mouth calls produce great cow calls. This makes them very valuable for up close work. Your hands are free to operate a bow or rifle and the call is still available for use. Learning to use a mouth diaphragm is well worth the effort. The rule for elk calls is try several of them to see what works best for you. Buy the calls that interest you and learn to use several of them for the best results. Some days elk will respond differently to a particular note or call. Spend some time learning each type, and watching bow hunting videos is a great way to get a feel for what works in a condensed format.